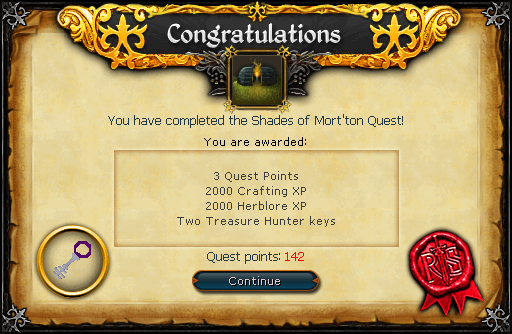 Mort Myre's southern border has been breached, and a path towards a strange town called 'Mort'ton' has been found. Begin by searching a shelf in the southwest corner of Mort'ton for a Diary. 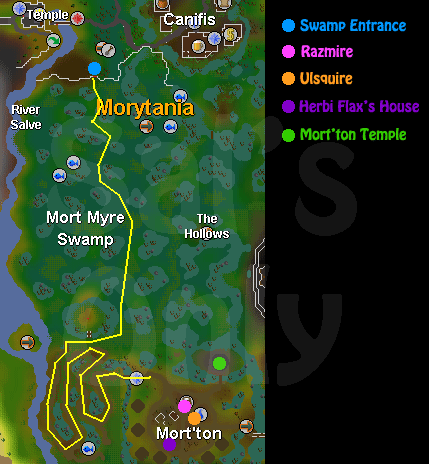 Firstly, head to the village of Mort'ton, found just south of Filliman Tarlock's camp in the Mort Myre Swamp. Follow the twisting path to the village, and then go into a small house in the southwest corner. Search the shelf for the Diary of Herbi Flax and read it. Now search the table for 3 herbs: 2 Tarromin and a Rogues Purse. Fill a vial with water, add the Tarromin, and then add some ashes from a fire. You'll now have a Serum 207 which can be used on Razmire, the Shop owner. Ask Razmire about the Shadow Creatures, and he'll ask you to bring him 5 Loar Remains. You can find a group of level 40 Loar Shadows to the north, and after killing 5 of them and picking up their remains, go back to Razmire who will take 2. Now head to Ulsquire to the southeast and use the serum on him. He will take some remains, and ask him what he found out. He says that you need Pyre Logs to burn them. Limestone - can be mined from the site just west of the Monk of Zamorak Temple, where you start the Priest in Peril Quest. Limestone Bricks - use a chisel with Limestone to make these. Planks - Found just north of the Barbarian Outpost, or in level 25 Wilderness, just northeast of the Chaos Temple. Swamp Paste - Pick up some tar from the swamp, add flour and then cook over a fire. Once you have the items, head to the temple in the northeast corner of the village. It's best to be on the "home world" for Temple Building (World 88), as this will make it much easier to re-build the temple! Begin reinforcing the temple wall, watching the Temple Repair chart in the top right-hand corner of the window. When your Sanctity is at 10%, the flame in the center of the temple will be able to be lit using a tinderbox. Once lit, use the Olive Oil with it to change it into Sacred Oil. Now use the oil with some logs to get Pyre Logs, and obtain some Loar Remains if you don't still have some with you. 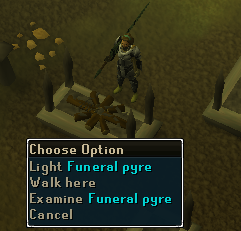 Use the logs with any of the Funeral Pyres around the village. Use the remains with the Pyre, and then light it with your Tinderbox. You can also take the Key from the stand. Use another dose of the serum with Ulsquire to complete the quest and get your reward! Optionally, you can make a permanent cure by increasing your sanctity to 20% at the temple, and then using Serum 207 with the fire to get a Serum 208. 2,000 Herblore experience 2,000 Crafting experience The Key you get from the stand allows you to enter the tomb to the northwest of Razmire's store. By killing the shades and burning their remains, you can get different keys to the doors, leading to treasure. You can use the Diary of Herbi Flax on the Apothecary in Varrock for an additional 335 Herblore experience. [^] Buy olive oil, about 5 limestones, 5 limestone bricks, 15 swamp paste, and a hammer from his building store.